BOBBY Davro is to host his seventh comedy gala in aid of the Woking & Sam Beare Hospices at the New Victoria Theatre in Woking. The show, which raised more than £20,000 last time, will feature a wide range of acts, including the star comedian Jim Davidson, the TV presenter Jeremy Kyle, the impressionist and Britain’s Got Talent finalist Danny Posthill, and the Billy Joel tribute act Elio Pace. Also on the bill are Tom Binns playing the “psychic” Ian D’Montfort, the comedians Phil Butler and John Moloney , and the a capella group The Magnets. 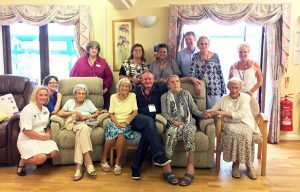 Last week Davro, who mother was at the Sam Beare hospice, made one of his regular visits to patients and staff at the Woking premises.